Cartel Announces ‘Chroma’ Acoustic Video Series! 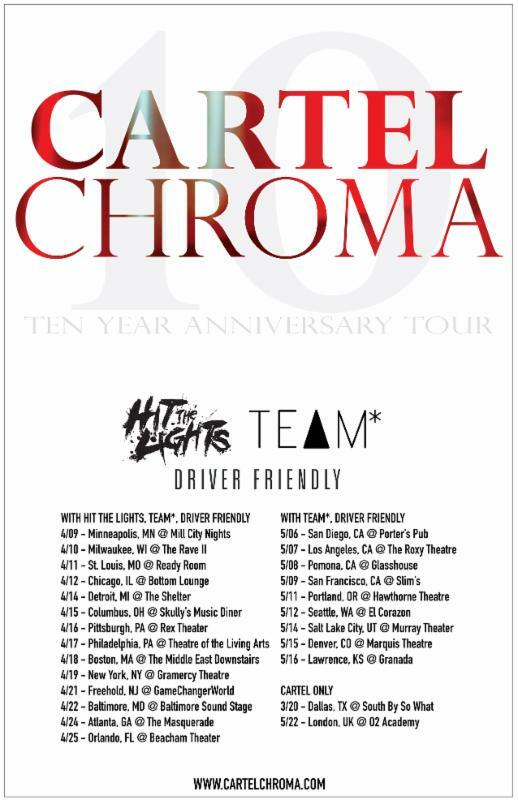 Cartel’s highly-anticipated 10 Year Anniversary Chroma tour is officially on sale for the general public at CartelChroma.com. The band announced last week they will be joined by Hit The Lights (East Coast only), TEAM*, and Driver Friendly officially kicking off April 9th in Minneapolis, MN at Mill City Nights. Pre-sale for the tour was a hit selling out in Chicago, Detroit, Columbus, and Los Angeles within minutes (additional tickets have been released to the public and are available now). In addition, the band announced their long-awaited band-approved edition of Chroma on vinyl via Field Day Records (also on sale now at CartelChroma.com). The official release features include 180g double vinyl, a first pressing of white vinyl, and a gate fold in die-cast slip. Only 1000 copies were made for the initial pressing. Cartel Announces Pre-Sale For ‘Chroma’ 10-Year Anniversary Tour & Vinyl! 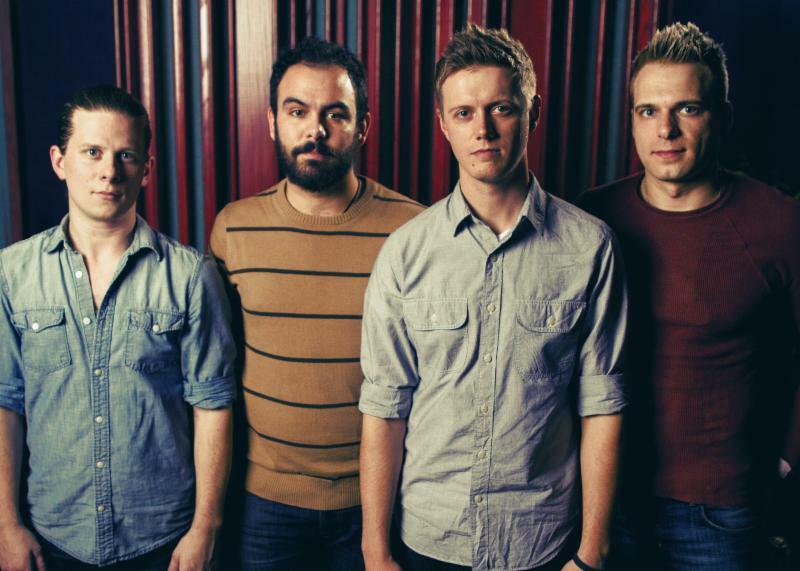 Monday, Cartel announced their highly-anticipated headlining tour in celebration of the 10th anniversary of their classic 2005 album, Chroma. The band will be joined by Hit The Lights (East Coast only), TEAM*, and Driver Friendly officially kicking off April 9th in Minneapolis, MN at Mill City Nights. To celebrate, Cartel will be releasing the long-awaited band-approved edition of Chroma on vinyl via Field Day Records. The official release features include 180g double vinyl, a first pressing of white vinyl, and a gate fold in die-cast slip. Only 1000 copies were made for the initial pressing. Today, fans can head over to CartelChroma.com for the pre-sale of both tour tickets and vinyl. Tickets will go on sale to the public this Friday, February 6th 3pm EST at CartelChroma.com. The September 2005 pop punk debut album (produced/engineered by Zack Odom and Kenneth Mount) powered by the melodic hits of “Say Anything (Else)” and “Honestly” catapulted Cartel’s career in the music world. In its first week of release, it sold over 3,000 copies, debuted #1 on Soundscan’s Alternative New Artist Charts, and hit #2 on Billboard’s Heatseeker chart. The band grew in popularity earning them a deal with Epic Records and tours with New Found Glory, The Early November and Hit The Lights. Chroma was re-released in June 2006 which included new artwork and a 3-song live EP entitled Live Dudes with an updated version of “Save Us,” featuring the entire band backing Pugh on piano. Chroma has sold over 250,000 copies since its release.